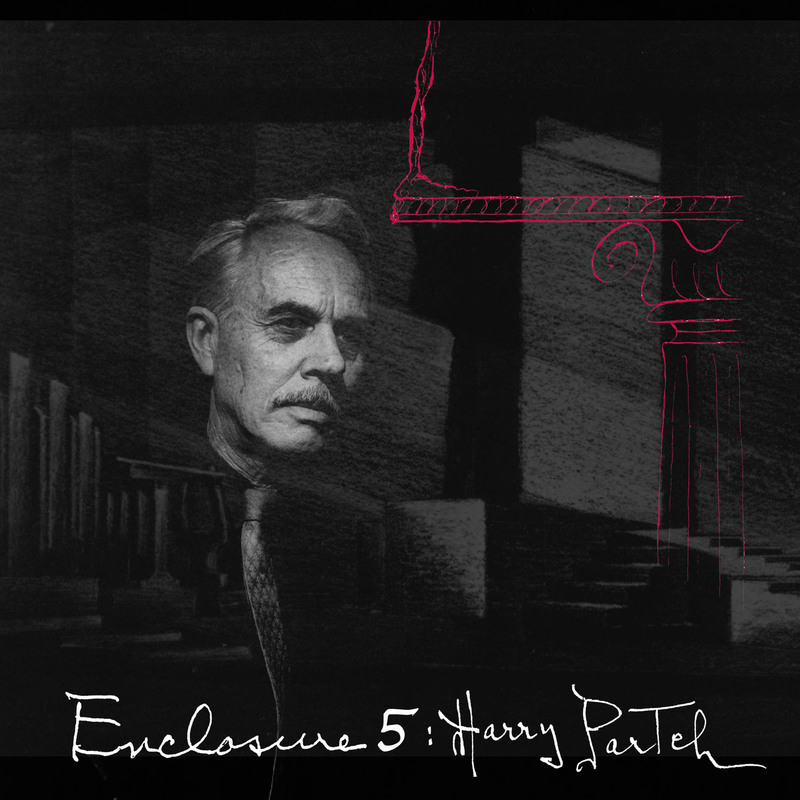 Enclosure Five, the fifth installment of this multi-media biography, is a 3-CD set focussing on Partch’s works inspired by ancient Greece. It includes important works published here for the first time, reissues of out-of-print recordings, and new performances. With this issue, virtually the entirety of Partch’s recorded ouevre is publicly available for the first time. Taken with the rest of the Enclosures Series and the Harry Partch Collection on CRI, we can now begin to assess Partch’s whole output. Works include: • A reissue of Ulysses at the Edge with Jack Logan playing the trumpet part originally intended for Chet Baker; • Revelation in the Courthouse Park (after The Bacchae of Euripides), in its original version recorded at the University of Illinois in 1960 and excerpted on Partch’s own Gate Five records; • King Oedipus, the culmination of Partch’s Speech-Music period, in its original version. Although Partch considered this his most important work (it took 19 years to write) and an excellent performance (featuring the incomparable Allen Louw as Oedipus and Rudolphine Radil—pupil of Mahler—as Jocasta), it was never released; • Miscellaneous short Speech-Music works: By the Rivers of Babylon (reorchestrated from the version heard on Enclosure Two); Come Away, Death from the lost collection, December 1942. This work, for voice and guitar, appears with the work by Douglas Moore that inspired Partch’s own setting; and Minuet, a curious Baroque duet performed by Partch and his then-student, Ben Johnston; • The Bewitched (A Dance Satire) in a 1980 recording from Germany featuring an extraordinary performance and recording of this major Partch work (produced by Kenneth Gaburo for the Berlin Festival, with Danlee Mitchell, music director and Isabelle Tercero as The Witch). Partch’s own spoken introductions to two of the works are included as well as an extensive booklet. Volume 5 may scrape the bottom of Partch's barrel, but what a barrel! Apart from some politely truculent radio statements, the real prize of these three discs is the CD premiere of King Oedipus, the work with which Partch paid homage to Yeats and tied his early output to ancient Greek drama. It sounds every bit as weird and mannered as the original Greek drama probably would if accurately reconstructed, yet the story imprints itself powerfully, with some occasional thrilling climaxes on Partch's home made instruments. Partch and Ben Johnston perform a well-tuned Baroque minuet, and there are a few dreary vocal works demonstrating Partch's early concept of corporeality, plus the old Gate 5 recording of Revelation in the Courthouse Park and Kenneth Gaburo's fabulous production of The Bewitched. For Innova's project as a whole, A plus is too weak a grade. In one way, Partch is actually more fortunate than conventional composers, because he never suffers from mundane performances by indifferent, or simply overworked, musicians. By their very nature, his works are almost always performed by folk who are, to muddle my metaphors slightly, champing at the bit to get their teeth into them. Without meaning to diminish the immense dedication that went into the enormous task of finding, assembling, and preparing the materials, that’s why Innova’s Enclosures contain so much stunning stuff. Even a churlish grumble-guts like me is left with precious little to moan about Still, it’s good for the soul have to indulge in effulgent praise of something now and then, and even better to admit that in this respect Enclosure 5 has twisted my arm with a vengeance.